This interesting surname has a number of possible sources. Firstly, the surname may be of early medieval English origin, and is from the female given name "Hannah" or "Anna", from the Hebrew "Chana", meaning "He (God) has favoured me (i.e. with a child)". This was an extremely popular name in the form of "Anne" and its variations throughout Christendom, partly due to its being the name of the mother of Samuel in the Bible, and to the belief that St. Anne was the mother of the Virgin Mary. Secondly, the surname may be Scottish, where it is also found as Hannay, and means "son of Senach", from the Gaelic "ap Sheanaigh". It is also a locational name from an unidentified or lost place. An estimated seven to ten thousand villages and hamlets are known to have disappeared since the 12th Century, due to such natural causes as the Black Death of 1348, and to the widespread practice of enforced "clearing" and enclosure of rural lands for sheep pastures from the 15th Century onwards. 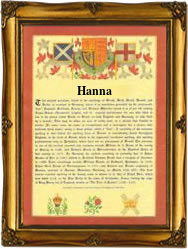 John of Hanna was master of a ship belonging to James 1, King of Scotland, in 1424. Finally, the surname may be of Irish origin, and is an Anglicized form of the Gaelic "O'hAnnaigh", descendant of Annach, a byname meaning "Iniquity". Practically all the Irish Hanna's today belong to north-east Ulster, where they are numerous. On April 27th 1627, Elizabeth, daughter of Robert and Ann Hanna, was christened at St. Martin in the Fields, Westminster, London, and William Hanna married Jannet Ervine in 1692, at Clones, County Monaghan. The first recorded spelling of the family name is shown to be that of Gilbert de Hannethe, Wiggetone, which was dated 1296, when he rendered homage, during the reign of John Balliol, King of Scotland, 1292 - 1296. Surnames became necessary when governments introduced personal taxation. In England this was known as Poll Tax. Throughout the centuries, surnames in every country have continued to "develop" often leading to astonishing variants of the original spelling.